The Congress today staged a walkout in the assembly in protest against the refusal of the government to handover the inquiry into the suicide of college lecturer Ritu to the CBI. Suspecting foul play and conspiracy in the suicide of college teacher Ritu, her family today demanded handing over of the case to CBI and arrest and removal of IG (Law and Order) Pradeep Kumar and his son Siddharth, Sub-Judge, from their respective posts. Having been ranked as second best in the country after Kerala in the field of education, the hill state with an enrolment of over 108 per cent at the primary level has set the ball rolling for implementation of the Right to Compulsory Education Act as the Cabinet has already approved the initiatives which will ensure formal education for all. Chief Minister Prem Kumar Dhumal has released Rs 3 crore for the development of Dharamsala in view of forthcoming IPL matches, scheduled for April 16 and 18.The funds would be spent on remetalling of road leading to Dharamsala, painting buildings to give a new look to the town and lightening up of roads with colourful lights. The decision to release the amount was taken yesterday. A fire today destroyed an old building that housed the office of working plan, divisional forest officer (DFO), Sundernagar, and also gutted the adjoining store that contained office documents and old furniture. The fire has exposed poor fire safety in the office. The assembly today witnessed heated exchanges between treasury benches and opposition members as it was virtually a day of walkouts as animated Congress members left the House on three occasions, dissatisfied with the government stand on various issues. With little hope of extension of the special industrial package, the two hill states of Himachal Pradesh and Uttarakhand have decided to join hands and unitedly fight for seeking their right from the Congress-led UPA. Talking to mediapersons here today, Chief Minister P.K. Dhumal said he was still hopeful that the Centre would extend the package as otherwise this would amount to injustice with Himachal. “It appears that Himachal is paying a price for being a peaceful state as militancy-affected states of Jammu and Kashmir and Uttarakhand are getting special industrial package,” he said. Chief Minister PK Dhumal will lead a high-level delegation, including ministers, state party chief of both the BJP and the Congress and all MPs from Himachal, to seek restoration of the special industrial package given to Himachal by the NDA regime till 2013. The assembly today passed the HP Tax on Entry of Goods into Local Area Bill 2010, amidst a walkout by the Congress against imposition of tax on entry of certain commodities into the state. It was through a call attention motion by HPCC chief Kaul Singh Thakur that the matter came up for discussion in the House. “It is a very serious matter which has put a big question mark on the credibility of not only the police but also the government as the name of a IG rank police officer is linked to the case, so it is only through a CBI inquiry that the family can hope to get justice,” Thakur said. He said it was creditable that the SSP (Shimla) had registered a case against his own senior but it was simply not possible for an IG rank officer to hold an inquiry against another IG, who is named in the FIR. He added that the case, which was making national headlines, had become very high profile and it was only a CBI probe that would bring out the truth. He added the family and eyewitnesses alleged that Ritu’s diary and suicide note had been removed. In his reply, Chief Minister PK Dhumal, who holds the Home portfolio, said the government was not averse to handing over the inquiry to the CBI or any other agency but since the inquiry had already been entrusted to the CID, that process should be allowed to complete. “In case the family of Ritu, who met me today, are not satisfied with the inquiry we can still seek a CBI probe, who will also want to know what the state police has done about the case at its own-level,” he said. Dhumal, while terming the incident as very sad and unfortunate, said it was important to get to the truth. “I want to assure that the guilty will not be spared while innocent will not be punished,” he said. He added that the government would be prejudicing the CID inquiry by handing over investigations to the CBI at this stage. Reiterating his demand for a CBI probe, the Congress chief said it was not possible for the CID to hold an impartial inquiry into the case. The father of the deceased, Sampuran Singh Kalmotia, today met the Chief Minister along with other family members. “I suspect foul play in the death of my daughter who may have been murdered so I want that the inquiry be handed over to the CBI,” demanded Kalmotia, in a representation given to the Chief Minister. Alleging conspiracy by IG and his son, the father of the girl who committed suicide on March 28 said the manner in which the IPS officer reached the spot and broke open the door along with two other men raised doubts and suspicion in his mind. Kalmotia alleged that that there was a possibility that his daughter was murdered. Relatives indicated that the family was likely to move court to seek justice in the case. A case under Sections 306 and 201 of the IPC has already been registered against IG Pradeep Kumar, Boileauganj Additional SHO Mathura Dass and his driver. The hill state with a network of 10,750 primary schools and the best pupil-teacher ratio (PTR) of 13 as against the national figure of 40 is taking steps to improve infrastructure to ensure quality education. “We already have a very good record as far as education sector is concerned but certain areas like regulation mechanism for private schools and reservation of seats for SC and ST students in private sector needs to be taken care of,” Chief Minister PK Dhumal said. With the state government having been forced to wind up almost 40 schools with less than five students, the thrust now is on providing quality education and strengthening of infrastructure in the existing institutions. Himachal has a dropout rate of less than 1 per cent, which again is amongst the lowest in the country while its literacy rate is second. “Our endeavour is to provide free and compulsory quality education to all and at present we have 4.65 lakh students enrolled in 10,750 primary schools,” Education Minister ID Dhiman said. While admitting that there was a problem of vacancies in some remote schools, he said 13,329 teachers had been appointed while selection of 4,157 was in the pipeline. Faced with the quandary of having more schools than required, Himachal has more than 200 schools with strength of five students, 350 schools with less than 10 students and 400 schools with strength of less than 15. “Only very few areas like the gap of schools in the neighbourhood and regulatory mechanism for private schools needs to be taken care of otherwise Himachal has excellent record in the education field,” secretary (Education) Srikant Baldi said. Even as the hill state has the best primary school infrastructure in the country at 1.74 schools per 1,000 persons, the quality of education and awareness level among the students certainly needs improvement. Despite geographical constraints the state has achieved the literacy rate of 83 per cent, second only to Kerala. Earlier, local ministers and MLAs were directed to spend amount from their respective constituency development funds in view of the IPL matches. This had caused a bit disenchantment among the local leaders who were feeling that even the amount meant for development of the rural areas was being spent in Dharamsala in view of the IPL matches. However, the delayed release of amount has also raised concerns regarding the usage of funds. Various departments have just 14 days to utilise these funds. In this short period, officials cannot follow the standard procedure of calling tenders for the works and then allotting it to lowest bidders. As per the rules, press tenders have to be issued for any work worth more than Rs 50,000. Already, concerns are being raised regarding poor quality of works being carried out. The white paint marking was carried out on the main road passing through Dharamsala about a week ago. However, in certain portions it has already vanished. Many works like repair of drains along the roads are still going on. For this purpose, pipelines of the IPH department have been uprooted at many places. The department would have a challenge to complete the work before April 15. The municipal council has started construction of shops in Kotwali market area to accommodate roadside vendors. The work is unlikely to be completed within 15 days. Parking and maintaining law and order situation is likely to pose a major challenge for the district administration during the IPL matches. The city gets clogged even at a weekend due to influx of tourists from plains. During IPL matches, 22,000 people are expected to come to Dharamsala. In case proper arrangements are not made, the city is likely to get clogged with incoming vehicles. The district administration has decided to create a parking in Dari area, about 5 km from the cricket stadium. Local minister Kishan Kapoor has thanked the CM for releasing Rs 3 crore for the development of Dharamsala. A BBMB tender rushed to the spot within minutes the fire station was sounded by the forest office and controlled the fire with the help of office staff, police and local residents. The DFO office staff sounded the BBMB fire service at Sundernagar as soon as the fire was spotted around noon today. The office was locked and there was just a chowkidar to look after the building, claimed forest officials on the spot. Conservator of Forests at Mandi BD Suyal said the fire broke out due to short-circuit in the old building, which was locked and housed the office of working plan. The documents pre-date 2000 were destroyed in the fire, he added. He said loss was estimated at Rs 3 lakh, including buildings and furniture. So far no foul play is suspected in the cause of fire, he added. Sundernagar DSP RK Chandel said the fire was caused by a short-circuit and so far no foul play had come to light on the part of any official or other elements. However, investigations are on, he added. It was on a query about conversion of district JBT cadre into a state cadre by Harshwardhan Chauhan of the Congress during question hour in the assembly today that had the entire opposition on its feet. Dissatisfied with the reply of education minister I.D. Dhiman, the debate saw tempers running high as Chief Minister P.K. Dhumal accused the Congress members of behaving in a most irresponsible and non-serious manner when they left the House raising slogans against the government. Repeated assurances by Dhiman that having a state cadre for JBT recruitment and appointment would be in the interest of the youth did not cut much ice with the Congress members. HPCC chief Kaul Singh Thakur accused the government of bringing about a change in the laid-down policy for recruitment and appointment of JBT teachers with the intention of giving benefit to particular areas despite opposition by JBT Teachers Union as well. While seeking a review of the decision, Harshwardhan said this would place youth of the backward areas at a clear disadvantage and deny them the opportunity of serving in their home district. “There is no question of reviewing the decision as it has been taken with the objective of filling 644 JBT vacancies and selected candidates would be asked for three options in case there is no vacancy in their home district,” said Dhiman, rejecting the Congress demand. He added that once a candidate was appointed in a particular district, his cadre would not be changed even if he belonged to another district. Lashing out at the Congress, the chief minister said the Congress, which was issueless, leaderless and directionless was behaving in such an irresponsible manner as they were frustrated and disappointed. “If they cannot understand that the change in policy is aimed at filling all vacancies and providing jobs to youth, then they deserve to sit in the opposition only,” he said. He said he had already spoken to his Uttarakhand counterpart and the two states would fight for their right both legally as well as politically. “We are considering taking legal action to fight against the discriminatory attitude of the Centre,” he said. He lashed out at Union Steel Minister Virbhadra Singh for making political statements rather than protecting Himachal’s interest. He appreciated the initiatives taken by Union Commerce and Industries Minister in seeking the extension of the package to HP. He said the special industrial package had been given to HP by the NDA regime in 2003 for 10 years, which was curtailed to 2010 by UPA regime. “There is no truth that there has been flight of industries from other states and it is only under their expansion plans that new units have come up in Himachal,” he emphasised. 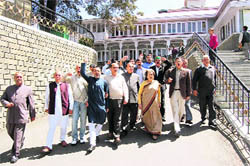 The Himachal Cabinet today adopted a resolution to represent its case for restoration of Special Industrial Package granted to it by the NDA regime before the Prime Minister. It was decided that the demand for restoration of the package be raised before the PM by a high-level delegation. Chief Minister PK Dhumal said the reservations of the Congress members on the Bill were totally unfounded as it would not affect the common man and small traders, who rather stood to benefit from it. “The Bill is in the interest of the state as it will generate resources and only seven items had been brought under its ambit,” he said. He said in fact the Congress, while in power in 2005, had passed a much harsher HP Local Area Development Tax Act, 2005, which covered 500 items and was passed despite the BJP’s opposition. “It is only those executing big projects who will have to pay tax on bringing bulk supply of items like cement and petrol into the state and are at present not paying any tax on it,” he said. The Chief Minister also rejected the demand of the Congress that tax be levied only in certain areas. “Industry can come up in any part of the state, so this tax cannot be area-specific and has to be levied at all entry points of the state,” he said. Congress legislator Rajesh Dharmani, who had given certain amendment suggestions on the proposed Bill, sought clarification from the Chief Minister about cloth and sugar also being taxable items under the entry tax.